Creativity hits when I am crunched for time. I think there are two kinds of people. One who needs slow, down time to allow those creative juices to spur them on and ignite their spirit, and then there are those creatives who are pushed for time, typically procrastinate, and creativity hits in the midst of the crunch. I want to be the first. I really do. I still may be that person when I grow up, but for now, I’m the later. This time, it worked out well for me. Some of our favorite extended family guests were in town and a leisurely breakfast, turned brunch, was on the agenda. My plan was to make my Sausage and Egg Bake (per our daughter’s request, but I was substituting bacon) and my Cracker Barrel Hashbrown Casserole. As we sat sipping our morning coffee and enjoying conversation, time got away from me. 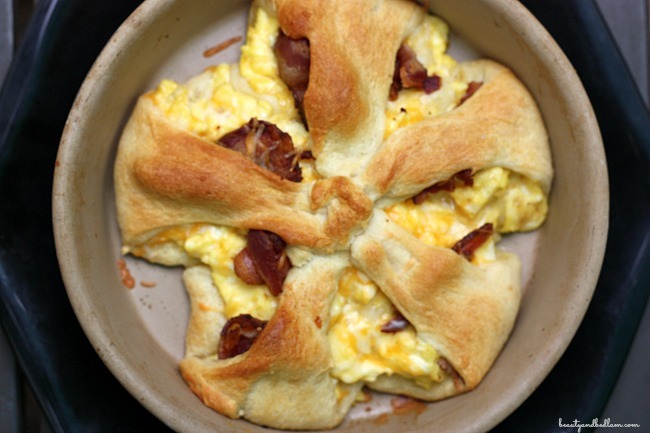 I got the bacon started and decided to forgo baking the casserole and make some creamy scrambled eggs instead. We were nearly finished eating when I realized the crescent rolls were still out, and my high schoolers were still sound asleep. 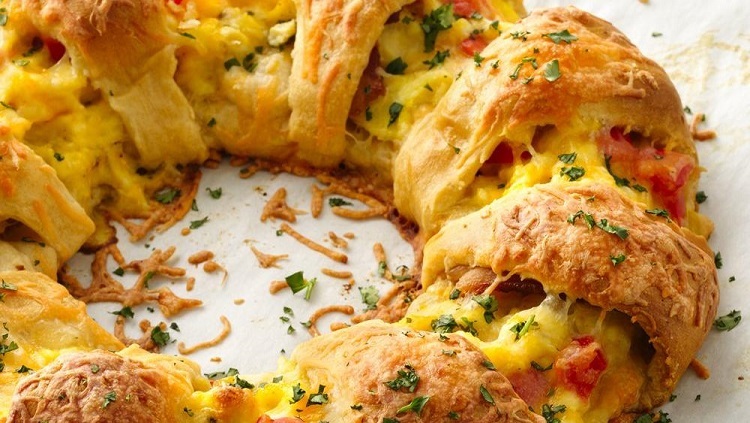 Anything goes, so definitely a personalized Egg and Cheese Crescent Breakfast Ring will be a winner! The best part is that I even did these in our toaster oven. We have a bit of an oversized one and it was the perfect solution to not heating the whole oven again. A favorite idea for feeding guests is my Breakfast Burrito Bar. 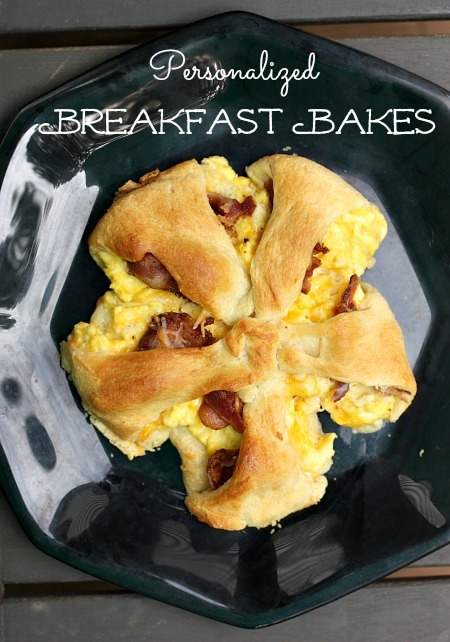 Why not take the exact same principle and make these personalized breakfast rings? I’ve been making all varieties of these rings for nearly two decades, but “maybe” Pillsbury or Pampered Chef first introduced the technique? I haven’t seen personalized size ones before and I just love them. While I used a small round baking stone in the picture above, it would be even easier to use a flat pan. Of course, making a full size ring, such as the one pictured above, is perfect in so many ways. I won’t waste your time with typing out all the directions because it’s so easy and the amounts used will depend on how many small rings you want to do. 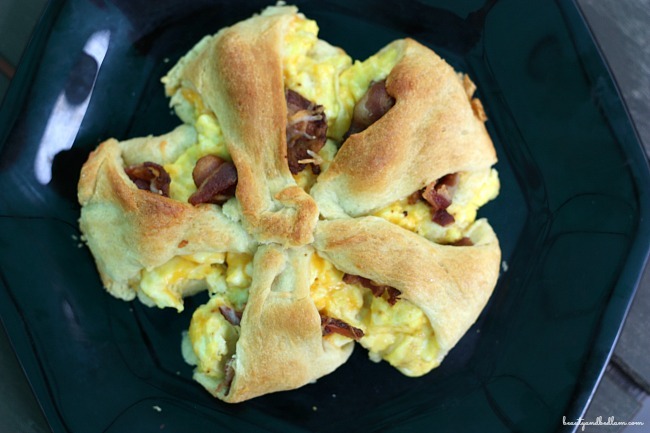 For one small ring, I used five creamy scrambled eggs, cheese, five pieces of cooked bacon and five crescent dough triangles. I stuffed them quite full so you could add more dough and less ingredients. 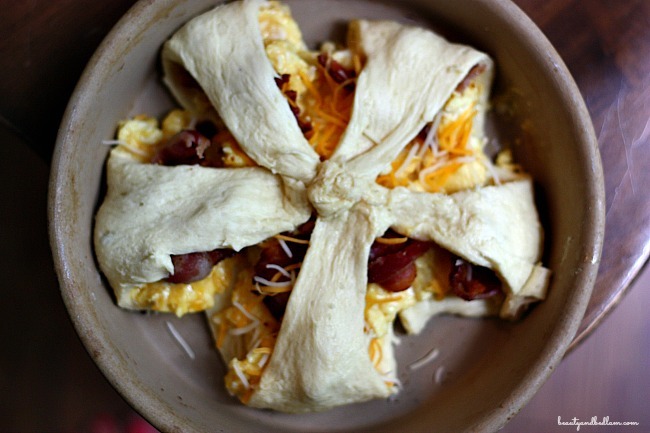 My suggestion is to undercook the eggs just a bit since they will continue to cook in the oven. 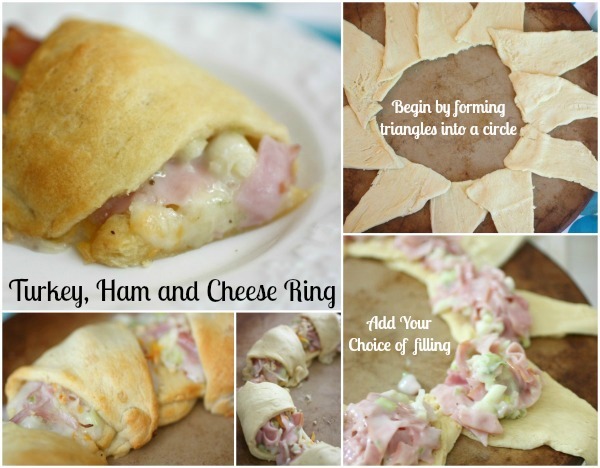 Follow the cooking directions per my Turkey, Ham and Cheese Ring post and voila, you have such a fun and festive Personalized Breakfast Meal. I am thinking of all the great ways I can implement this for slumber parties, holiday company and even picky eating kids. What a great idea. I can see my kids loving this!! Thanks so much!! Hope they enjoy it. 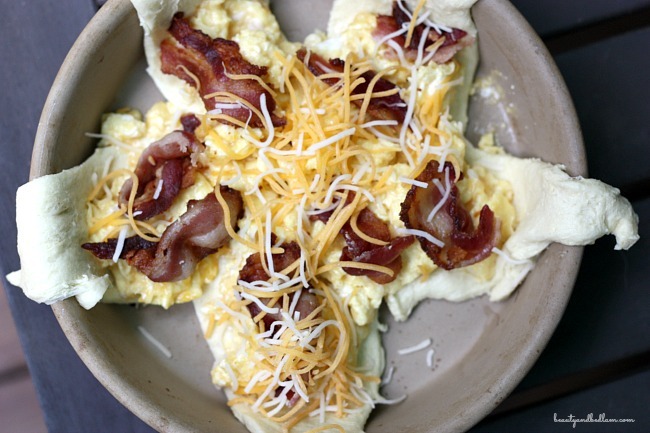 What do you make your scrambled eggs with that make them creamy? I need to do a post on this one because it’s just a little trick that makes such a difference. First of all, slow and low heat. It takes more time but it makes such a difference and then I put just a small dollop of either sour cream or mayo in it. I know the mayo sounds odd but you don’t even taste it and it does wonders.